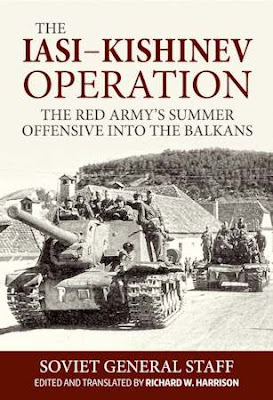 The Iasi―Kishinev Operation, 20-29 August 1944: The Red Army's Summer Offensive into the Balkans details the Soviet preparation and conduct of the Red Army's massive offensive into Romania in the summer of 1944. The seventh of the ten strategic operations conducted by the Soviet armed forces that year, the operation successfully carried out the task of destroying German forces in northern Romania and taking Germany's Romanian satellite out of the war, and was the first step in Stalin's consolidation of a Balkan empire. The study, unlike many others in this series, is based only in part on materials published by the Soviet General Staff's historical section. Nonetheless, this and other material was written and published for the purpose of generalizing the experience of the war's experience for training commanders and staffs in the preparation and conduct of multi-front offensive operations. The study is divided into two parts. The first deals with the operation as a whole. This includes the preparations by the Second and Third Ukrainian fronts for launching the operation. This includes an overall strategic appreciation of the situation as it obtained by the summer of 1944 and the Stavka's instructions for carrying out an operation along the southern strategic direction. This is followed by a minute examination of the two fronts' plans for organizing and exploiting a breakthrough of the enemy front, as well as the individual army commanders' plans for their own sectors. The study concentrates on such standard operational indices as the length of the attack front, the density of forces along the breakthrough front, the echeloning of forces for the attack, and cooperation among the combat arms. Whereas the first part offers an operational-strategic overview of the operation, the second is firmly focused at the tactical-operational level. This study is actually a doctoral dissertation dealing with the Third Ukrainian Front's 37th Army, which played the leading role in the front's offensive across the Dnestr River, from where it subsequently linked up with the Second Ukrainian Front's forces to encircle the German Sixth Army. Many of the operational indices highlighted in the first part are repeated here in even greater detail. The successful conclusion of the Iasi―Kishinev operation destroyed the German position in the Balkans and laid the groundwork for the Red Army's subsequent advance into Hungary and Central Europe. As one of the army's more successful offensive operations, it is worthy of study by history buffs and professional officers alike.